Royal City Rag on May 27 focused on the Eden Mills Writers’ Festival. Festival Director of Operations Jane Hastings, Dan Evans from The Bookshelf and local author, Andrew Hood joined us live in the studio. This year’s festival takes place on Sunday, September 20. The festival also has a very special fundraiser, “Words That Sing”, taking place at Norfolk Street United Church on Sunday May 31 at 2.00 p.m. The fundraiser features renowned Canadian authors Michael Ondaatje, Jane Urquhart, and Leon Rooke. They will be reading from their work and taking part in a discussion facilitated by Linda Spalding. Soprano Theresa Thibodeau supported by John McClelland (piano), Tim Kramer (bass) and Adam Zaatinge (drums) will compliment the spoken word with some awe-inspiring music. Tickets are $20 ($15 for students) and available from The Bookshelf, 41 Quebec St. downtown Guelph. Guelph author Andrew Hood studied in the creative writing program at Concordia University in Montreal and won the Irving Layton Award for Undergraduate Fiction there. His first collection of stories, Pardon Our Monsters (Vehicule Press), won the 2007 Danuta Gleed Literary Award for the best first collection of short fiction in English. Andrew will be appearing at the Elora Writers Festival on June 7 and at the Eden Mills Writer’s Festival on September 20. We’re devoting the whole of Royal City Rag on May 27 to the Eden Mills Writers’ Festival which takes place on Sunday, September 20. Festival Director of Operations Jane Hastings, Dan Evans from The Bookshelf and local author, Andrew Hood will be joining us live in the studio. 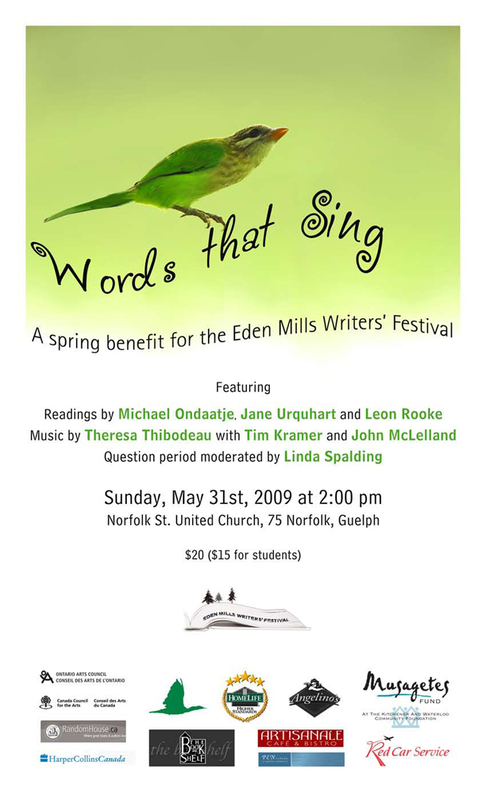 The festival has a very special “Words That Sing” fundraiser on May 31 featuring renowned Canadian authors Michael Ondaatje, Jane Urquhart, and Leon Rooke. They will be reading from their work and taking part in a discussion facilitated by Linda Spalding. Soprano Theresa Thibodeau supported by John McClelland (piano), Tim Kramer (bass) and Adam Zaatinge (Drums) will compliment the authors with some awe-inspiring music. The fundraiser takes place at Norfolk Street United Shurch on Sunday May 31 at 2.00 p.m.
Join us on Wednesday, May 27 from 6-7 p.m. on CFRU 93.3fm, Guelph’s Campus Community Radio Station. You know that summer is just around the corner when we start discussing the wonderful festivals that take place in Guelph! The 21st season of the Eden Mills Writers’ Festival takes place on Sunday September 20. This year, to kick things up a notch, there is an afternoon of readings and song that looks back to the festival’s origins. Twenty-one years ago, the first festival brought together some of Leon Rooke’s friends to celebrate his publication of A Good Baby. Those friends were Michael Ondaatje and Jane Urquhart. On Sunday, May 31 at 2:00 p.m. at the Norfolk St. United Church, Eden Mills Writers Festival is honoured to present Michael Ondaatje, Jane Urquhart, and Leon Rooke for a day of exceptional readings. In the true spirit of the Festival, the afternoon promises to be a celebration of literature, both written and spoken, its authors, and its readers. Theresa Thibodeau will add one more element of artistry to the afternoon with her awe-inspiring soprano solos. Whether you are a faithful attendee of the Festival or hearing about it for the first time, you will be among friends. Spread the word and be sure to get your tickets in advance. Look for them soon at The Bookshelf, 41 Quebec St. downtown Guelph. Tickets are $20 ($15 for students). Proceeds will go to support this years festival. Also, look out for a special Eden Mills Writers Festival edition of Royal City Rag on May 27.